Use the following procedure to protect File Share resources using SIOS DataKeeper and Microsoft Failover Cluster (WSFC). *IMPORTANT NOTE: DataKeeper Cluster Edition registration with Failover Cluster is automatic and occurs 60 seconds after detecting a Failover Cluster configuration on each node. 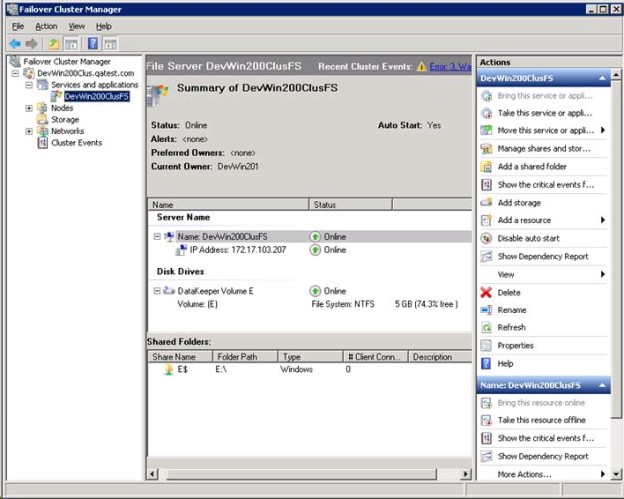 Create a mirror for the volume using the SIOS DataKeeper user interface. Make sure the mirror is in “Mirroring” state before protecting in WSFC. 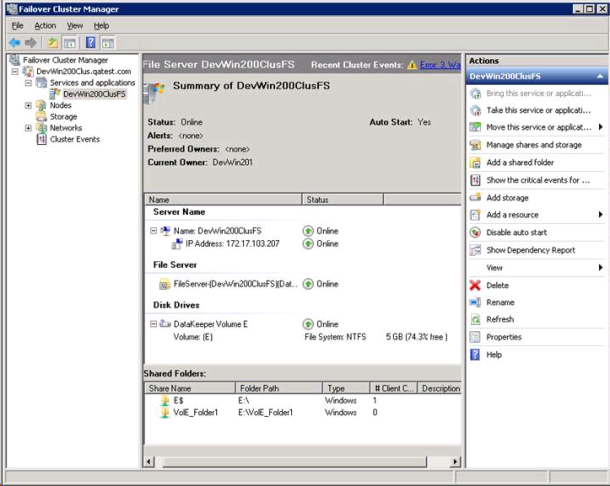 Use the DataKeeper Auto-register Pop-up to quickly register the replicated volume with WSFC. Select YES to auto-registration. The DataKeeper replicated volume will automatically be added to cluster Available Storage. 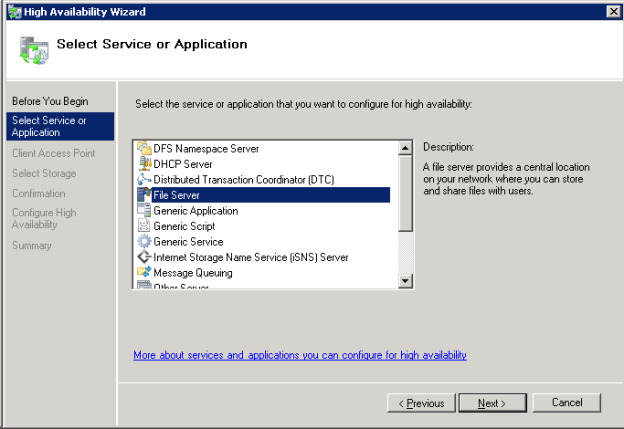 Right click on “Services or Application” and create a File Server resource. The File Server Role must already be installed on all the nodes in your cluster. If not, an error will be displayed. b. On the next screen fill in the File Server resource name and provide an IP address. Click Next. Add DataKeeper Storage to the File Server resource. a. Select the DataKeeper Volume check box above and click Next. b. The File Server Confirmation screen will be displayed, confirm it and click Next. c. The File Server Configuration Summary will be displayed, Click Finish. d. The File Server resource will be created with the DataKeeper volume root path as shown below. 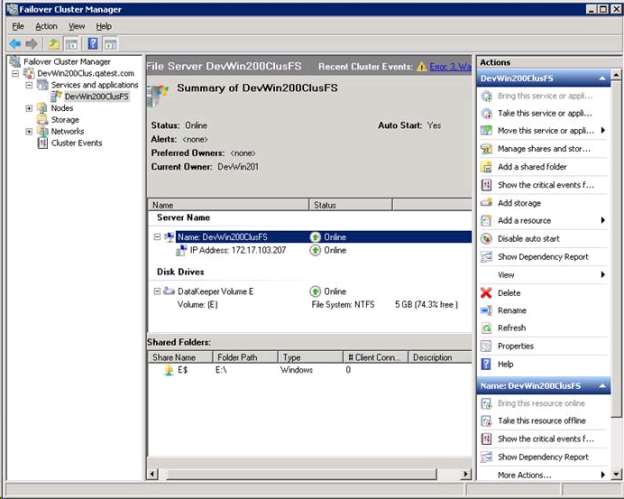 Using the Failover Cluster Manager, create a resource dependency from the File Server resource to the DataKeeper Volume resource. This dependency relationship is very important to coordinate in-service and out-of-service operations of the file share and volume resources when moving the File Share resource from one node to another node. a. Right-click on the File Server resource name (center panel, selected above), then select Properties. b. 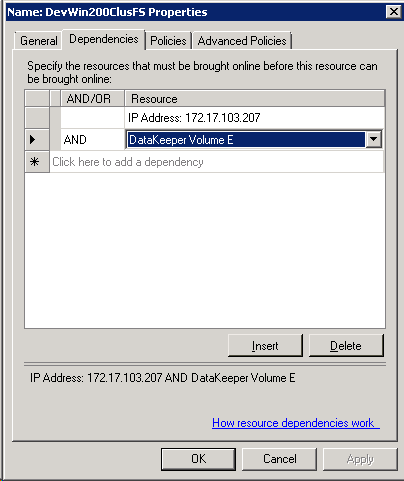 Add the DataKeeper Volume resource as a dependency for the File Server resource, and click OK. The File Server resource is now ready for file shares to be added. File Shares can be added several ways. a. Right-click on the File Server resource (highlighted below) and select “Add a shared folder”. Or, use the “Add a shared folder” action on the right panel shown below. b. 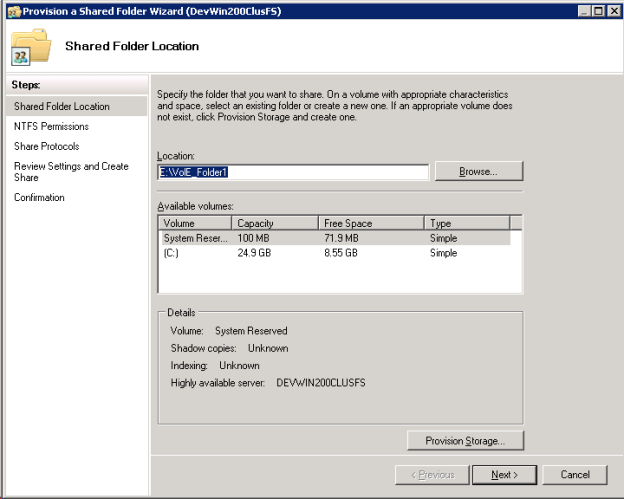 The Shared Folder Location screen shown below includes a browse button to locate the folder to share on the DataKeeper Volume. Then click Next. 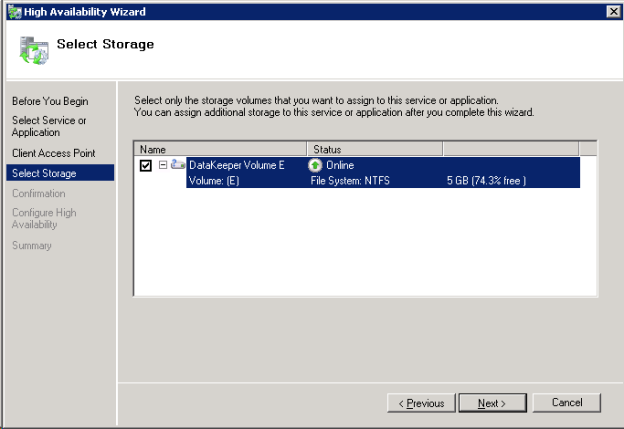 c. The NTFS Permissions screen provides alternative NTFS permission level, and click Next. d. The Share Protocols screen provides protocol selection, share name, confirm Share Path, and click Next. e. The SMB Settings screen provides a Description for the Share, and click Next. f. The SMB Permissions screen provides alternative SMB permissions, click Next. g. The DFS Namespace screen provides a publish to DFS namespace option, click Next. h. The Review screen provides a configuration summary, click Next. i. The Confirmation screen displays success or failure to create the file share, click Close. Add a file share using a DataKeeper replicated volume resource is now completed. Shares are displayed in the lower Shared Folders panel shown below.